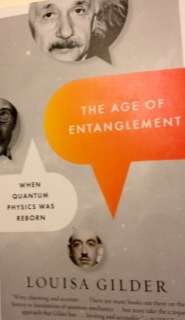 Gilder manages to weave the science (and its evolution), personalities, and the histories of the day together to present the most extensive (and engrossing) history of quantum physics that I could imagine. Notably, she goes much deeper into the controversies and interplay between the greats – and also their intellectual heirs. I particularly liked that she took the work well beyond the classic discussion of Einstein, Bohr, Heisenberg, and Schroedinger – all the way past the post-war period to the present day meditations on quantum computing and encryption. For a non-scientific reader, I may recommend Uncertainty: Einstein, Heisenberg, Bohr, and the Struggle for the Soul of Science as a warmup for The Age of Entanglement.